This October, Conuco Farm and Evolutionary Organics were struck by a devastating fire, losing a season’s worth of storage crops, farm equipment, and personal belongings. 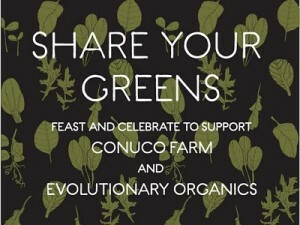 Conuco Farm is the Community Supported Agriculture farmer for Bed-Stuy Farm Share. They have driven fresh produce to Bed-Stuy each week for 5 years. The Bedford Stuyvesant neighborhood is a food desert (aka a low access area) and really benefits from having access to community supported agriculture. We’ll be attending the dinner on Tuesday, December 14th, and would love to see you there, too! Make a donation to the farm directly here. Thank you L & E! I know that Hector will appreciate the help we can give!